Here’s a little something I whipped up for Super-Munkyboy‘s Art Jam over at Deviant Art. 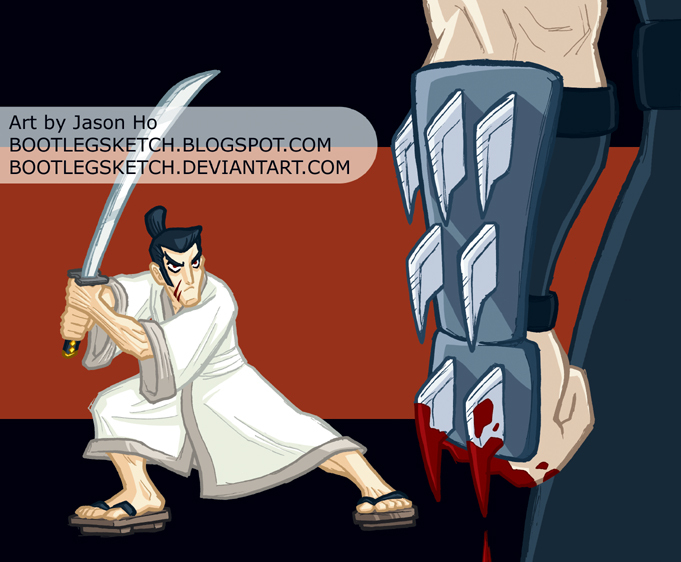 The subject was Samurai Jack versus Shredder. Check out the other entries here. As you can see, I drew Jack in my own style, rather than matching the look of the show, and I was a little pressed for time, so I “cleverly” figured out a way to avoid drawing Shredder (except for his arm, obviously). I think it more or less works, though I really feel like my recent stuff has been suffering from a certain degree of blandness. I think I need to try something completely new to shake things up here. Post Script: Oh yes, and for those who did not make the deduction, I started a Deviant Art (DA) account which you can find linked on the sidebar. But if you don’t want to move your eyeballs 15 degrees, just click here. Anything I post on my DA account will show up here as well, but you may be interested in going to my page to check out my Favorites, so you can see other people’s art that I’ve been drooling over recently. Post Post Script: And if you scroll down to the post just below this and read the comments, you can see that me and a few of my regular commentors are having a grand old time! Check Mark’s Hale’s blog for more. Post Post Post Script: Last one, promise–I caught up on replying to comments, all the way back to the Bumblebee post! Next > OMG! LOOK WHO’S RUNNING TO THE RING! def nice. i’d like to see you tackle shredder, tho. and i’m thinking of challenging u to a pic… FOR HONOR!!! yeah, honor won’t motivate u. but, i’m still going to be challenging you. uh. who are these characters?? Have they been in anything I have seen? charles: i accept! but it won’t necessarily be soon. :P but seriously–i do want to complete my series of turtles pics, and shredder will definitely be the opponent in one of them.